A recent journal article published by City’s Professor of Mathematical Physics, Professor Andreas Fring, has been selected as a publisher’s pick in the esteemed Journal of Physics A: Mathematical and Physical. 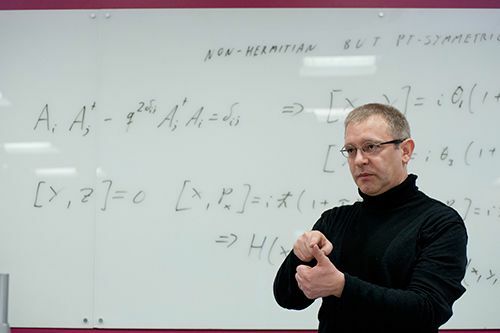 A journal article published by Professor of Mathematical Physics, Professor Andreas Fring, has been selected by the editors of the prestigious Journal of Physics A: Mathematical and Physical, as a publisher’s pick. Professor Fring’s research centres on integrable quantum field theories and quantum mechanics. His paper, titled “E2-quasi-exact solvability for non-Hermitian models” is also accompanied by an interesting interview. Professor Fring has co-authored more than one hundred articles in international journals and conference proceedings on topics including the form factor approach to integrable quantum field theories, factorised scattering theory, the thermodynamic Bethe Ansatz, representation theory of Virasoro algebras and Coxeter/Weyl reflection groups, high energy laser physics, pseudo-Hermitian quantum mechanical systems and noncommutative space-time structures. Quantum mechanics is a theory of matter that is based on the concept of the possession of wave properties by elementary particles, that affords a mathematical interpretation of the structure and interactions of matter on the basis of these properties, and that incorporates within it quantum theory and the uncertainty principle.